Your site structure is very important for both Google and your readers. When we create our websites, we often model others within our industry and add the ‘mandatory pages’. Pages such as home, about, services and contact us. This, of course, provides a basic site structure, instead of an awesome site structure that can be achieved with some planning time. Before you consider Google and the factors it likes you to include, I want to you first consider your customer, clients and readers. These are the people that matter the most and first, yes before Google. Once you have it right for them you can work on making it readable for Google. Luckily Google shows preferences for websites that are user friendly in both design, structure and content. One of the best ways to correctly structure your site is to switch your thinking. Instead of thinking that you are building a website to represent your business, consider that you are building a website as a marketing channel. You are an authority within your industry and your website will provide valuable content – to both readers and Google. Positioning your website this way, it’s the future of online marketing and is called Content Marketing. The definition from the Content Marketing Institute summarises it perfectly. Content marketing is using your content to build your authority, attract your ideal clients, build a relationship with them and encourage them to buy your products and services. Now, of course, content marketing doesn’t just appear on your website and isn’t just the written word. Content marketing’s reach is far and wide from your own website, submitting articles and blogs to others websites, being interviewed by others, creating videos, podcasts, infographics, emails, free challenges, all your social media content and so much more. When you make the mindset switch, it unlocks the potential and allows you to see new pathways. Instead of always focusing on the sale, it provides the time and space to focus on building your authority and brand. Build your relationship with your ideal clients and Google, and encourage the purchase of your products and services. Now instead of focusing only on the ‘mandatory pages’, what everyone else in your industry provides on their website you can use your newfound content marketing hat to create some really awesome content. Consider now that your content is going to attract, educate and convert your audience. It’s going to need to be more than just your “about” and “contact” page. But if you are like many business owners you have no idea exactly what to write about and what you should include. I can help with this. 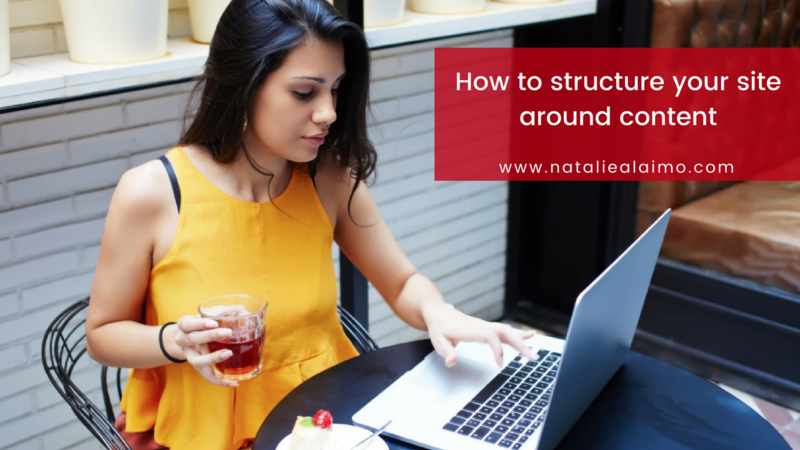 I could talk about content creation all day long, so let’s focus just on what’s important to build your basic site structure. I know I’ve mentioned ‘mandatory pages’ a few times – pages such as About, Contact and Services. Theses are of course relevant and should be included. However these pages aren’t going to win you any favours with your readers or Google. For both groups you need to go further. Remember the definition of Content Marketing – valuable, relevant, and consistent content. These are the pages that will create the rest of your website. I find the easiest way to create your site structure based on content marketing principles is to consider your products and services. From there you can create main content themes. Each website should have been 3 – 10 main content themes. These are the most relevant information about your products/services and industry. If you have a beauty salon then your main content themes could be based on your major services. These could be broad such as skin, body and face. Or they could be very specific such as microdermabrasion, facial peels, and facials. If you only focused on treatments for the face then you would want to be more specific than if you covered general beauty services. Remember at this stage you are creating your site structure and you don’t have to write all the content right now. If you think about having to create all the content now, your site won’t be very large and you will get completely overwhelmed. Both content marketing and search engine optimisation are long term marketing strategies that take time to formulate and implement. Don’t be too hard on yourself and try to get everything perfect right now. For each content theme you have decided on, you are going to create one main page. This main page is going to be the ultimate guide on your topic. It’s going to be epic and again it doesn’t have to be written in one day. You can start with a few hundred words and make small consistent improvements to it. This one main page is the page that you are aiming to rank in Google for. From this one page you will create more content in the form of blog posts that will link from this page. As it’s an epic page I want you to consider breaking down your topic into 5 – 10 mini topics. This could be steps i.e. 7 steps to Facebook Marketing or information i.e. 10 things you need to know before having microdermabrasion. This way you can easily create lots of content and have enough information left to expand your page at a later date. For each mini topic you will create a sub heading and write approximately 300 words under each. With 10 mini topics, an intro and ending you have easily written 3000 words – a fairly epic content page. Once you have created your main page and optimised it for Google you can begin creating additional blog posts. When planning your main content theme pages your individual blog posts will also be created. This will be 500 – 1000 words on the mini topics. For example, if this was a main topic page I could create a blog post on optimise your blog content. I could talk about selecting the correct keyword, using Yoast SEO plugin, renaming images and keyword density. You can decide how much or little detail you want to go into. If you have a service business i.e. beauty salon, there is no harm giving away the kitchen sink as your clients aren’t going to be able to do their own microdermabrasion. If you are selling courses then you might want to be mindful of your free vs paid content. Having said that I know many people who are epic bloggers and for a little bit extra sell the information as a course or ebook. They can do this as it provides more insights, support or makes the information easier for people to implement. At this stage you want to formulate your main topic pages and create a brief outline of it. This way you know moving forward which content you want to create. This outline forms your site structure. I mostly write down the main topics and mini topics before I start writing. I then just “fill in the blanks” and my content is written. Where possible you will include links to other articles within your website. At this stage of your planning you may not have any other content. And that’s ok, as you now know what additional content you want to create. Once you have written your main content page and the accompanying blogs you will have at least 8 pieces of content that all link together and surround one main topic. Both google and your readers will love this. Remember your website is a marketing channel and won’t ever be complete. My advice is to just start now, with one main content theme and start writing. Even if all you do is setup the page and write 300 words, it’s better than what you had yesterday. From there you can start to expand the page and create additional blog posts. Using this method will create your content hub. Content hubs are beneficial for both your readers and Google. If you want to take your learning further, join in me SEO Accelerator. It will show you how to optimise your website to make Google love it.